Each entry, about three or eight pages in length, offers a brief overview of the obstacles and victories of each woman. Bagieu includes their birth date, city/country of origin, any childhood influences, and thoughtfully explains how they overcame adversity and changed history. Agnodice was born in Fourth Century Athens when women are were barred from practicing medicine because they were suspected of performing abortions. “As a child, Agnodice witnessed women in her family suffer (and die) in childbirth. Instead of calling a male physician, women decided to manage the births themselves. Agnodice was outraged. Once she came of age, Agnodice studied medicine in Egypt. Upon returning to Greece, she dresses as a man and quickly became “the go-to Ob-Gyn in Athens.” Other physicians, upset by her popularity, accused Agnodice of seducing her married patience. But at her trail, to prove her innocence, Agnodice reveals that she was a woman. (In the picture it shows her holding up her toga) “Now even more outraged (and humiliated, mostly for being duped), these husbands and doctors sentence Agnodice to death for practicing medicine illegally. Coming to her rescue, a large group of angry women, many Agnodice’s patience, chastised their husbands for their verdict, telling them it was their fault for banning women from practicing medicine in the first place. After Agnodice was freed they made it legal for women to become doctors. Mae Jemison, Astronaut, has the distinction of being the first Black Woman to travel into space and be a guest in an episode of Star Trek. And then, there is Heddy Lamar, actress and inventor. Okay. I could go on and on (which I do when explaining this book to anyone who asks, “What have you read lately”), but I'll stop. 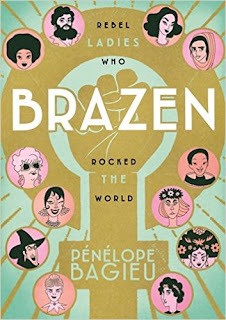 Though it is unfortunate Bagieu does not include any source notes or books for further reading, I believe this collection of biographies in comic format is the perfect book to give to reluctant readers or those who love reading comics. Click here to read an interview with Bagieu.